Natural gas is a mixture of hydrocarbons which, when liquefied, form a clear colourless and odourless liquid; this LNG is usually transported and stored at a temperature very close to its boiling point at atmospheric pressure (approximately – 160 degree C). LNG is very cold liquid form of natural gas - the fuel that's burned in gas stoves, home heaters, and electric power plants. When it warms back up, LNG becomes natural gas again. You can't liquefy natural gas without cooling it. Many countries export and many others import LNG by ship; the United States does both. LNG does not burn itself .LNG needs to be in vapor form and mixed with air to burn .Is combustible in the range of 5% to 15% volume concentrations in air .Combustible mixtures in confined space will burn explosively . LNG is a cryogenic substance and physical contact or spillage constitute a personnel and equipment hazard . Natural gas presents an asphyxiation hazard. Its main component is methane. It gasifies violently when directly introduced into a cargo tank at ambient temperature, rapidly increases the internal pressure of the cargo tank and makes the atmosphere into a flammable condition. In addition, the cargo tank is rapidly cooled, resulting tremendous thermal stress on cargo tank skins and cargo piping systems. To avoid such damages, the preparatory work for cargo loading after dry docking must be followed. 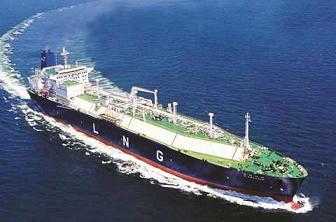 During dry dock all the compartments of an LNG carrier are kept gas free. After leaving the dry dock the vessel has to be prepared to load cargo, for that the following points to be considered with priority. Liquefied natural gas (LNG) compresses to a small fraction of its original volume (approximately 1/600) under liquefaction. Liquefaction reduces the volume of natural gas making it much more economical to transport. With the amount of flammable material that LNG contains, it has the potential to be an extremely dangerous chemical, if handled improperly. LNG is not as dense as petroleum, requiring between double and triple the space for the fuel tank. To alleviate the loss of space, some Norwegian designers locate the tanks under accommodation spaces, building protective coffers to hold the tanks. Others have placed tanks on deck where they can vent into the atmosphere should a spill occur. IMO guidelines do not prohibit placement of LNG tanks under accommodation, however, the USCG feels the decision requires careful analysis. The actual composition of LNG will vary depending on its source and on the liquefaction process, but in all cases the major constituent will be methane with small percentages of the heavier hydrocarbons such as ethane, propane, butane and pentane. In addition, small quantities of nitrogen may be present. However for custody transfer purposes when accurate calculation of the heating value and density is required the specific properties based on actual component analysis must be used. During a normal sea voyage, heat is transferred to the LNG cargo through the cargo tank insulation, causing vaporization of part of the cargo, i.e. boil-off. The composition of the LNG is changed by this boil-off because the lighter components, having lower boiling points at atmospheric pressure, vaporize first. Therefore the discharged LNG has a lower percentage content of Nitrogen and Methane than the LNG as loaded, and a slightly higher percentage of Ethane, Propane and Butane, due to Methane and Nitrogen boiling off in preference of the heavier gases. The flammability range of Methane in air (21% Oxygen) is approximately 5.3 to 14% (by volume). To reduce this range, the air is diluted with Nitrogen until the Oxygen content is reduced to 2% prior to loading after dry-dock. In theory, an explosion cannot occur if the O2 content of the mixture is below 13% regardless of the percentage of Methane, but for practical safety reasons, purging is continued until the O2 is below 2%. The boil-off vapour from LNG is lighter than air at vapour temperature above –110 degree C or higher depending on LNG composition Variation of Density with Temperature, therefore when vapour is vented to atmosphere, the vapour will tend to rise above the vent outlet and will rapidly disperse. When cold vapour is mixed with ambient air the vapour air mixture will appear as a readily visible white cloud due to the condensation of the moisture in the air. It is normally safe to assume that the flammable range to vapour-air mixture does not extend significantly beyond the perimeter of the white cloud. The auto-ignition temperature of Methane, i.e. the lowest temperature to which the gas needs to be heated to cause self-sustained combustion without ignition by spark or flame is 595 degree C.
What happens with if LNG spilled on water? How LNG transferred from shore to ships cargo tanks ? How to avoid structural steels suffering brittle fracture at low temperatures ? Code for the existing ships carrying Liquefied Gases in Bulk 1976 with Amendments and Supplements. International Convention on Standards of Training, Certification and Watch keeping for Seafarers.